Forward emails and attached files directly to your Neat account! 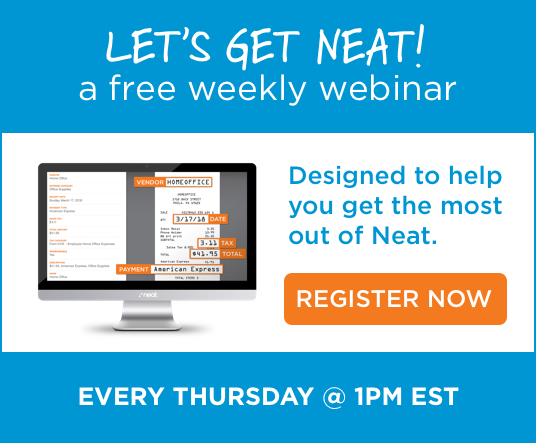 Every user gets their own unique @neatcloud email address, so e-receipts, electronic invoices, and other digital documents all have a home in Neat, right alongside your scanned documents. It doesn’t matter where an item comes from—if it’s important, it belongs in Neat! See It in Action. Start Your 30-Day Free Trial Today! A great feature for those who regularly purchase business supplies and materials from one place. Simply give the vendor your @neatcloud.com email and all invoices and receipts are automatically emailed by the vendor’s POS system directly into Neat. Neat will automatically create one entry for the email itself, and one entry for each attachment included in the email. Then, we’ll work our InDocument Identification Technology™ magic on everything you send in. That’s Neat!